Playful Meditation For Kids: Book Series. The Magical Rainbow Inside You is the first book published by the Playful Meditation For Kids publication series. A multi-learning resource created and published by cultural collaborator, professional artist and author, Roushini; to teach children about self-care and self-regulation from a younger age. How to meditate and become mindful. 8 Simple & fun steps to self-care & self-regulation. How to re-direct their anti-social behaviour. About self-acceptance & how to embrace their positive qualities. To acknowledge and express their emotions in appropriate manner. To enjoy reading, enhance literacy, numeracy & cultural learning. In printed version, ebook and ibook. Audio, Apps and Auslan system on DVD . Professional Development Workshops for teachers, educators, parents includig organisations working with children 3-5 & 5-12 years old. Tailored live presentation for: 3 -5 years including First Five Years library Program. Prep - Y6 - During school, OSHC ( Holiday Program & After-school). Created for children 3-12 years old however this is a valuable resource for all ages. 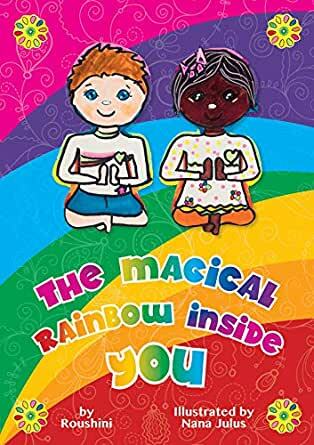 Similar books to Playful Meditation For Kids Publications: The Magical Rainbow Inside You: Teaching Children Self-Care & Self-Regulation From A Younger Age.